The Godzilla art book comes out on May 13, but publisher Insight Editions released a number of concept art spreads this week — including two which are exclusive to io9. 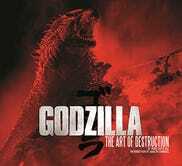 The concept art shows the hunt for Muto, the new monster in the film, a nuclear submarine dropped in the mountains, and a crisis at a Japanese nuclear power plant. Check them out! LEFT Dr. Brody monitors the crisis at the Janjira facility. BELOW The Janjira nuclear power plant control room was a daunting design challenge—everything from switches and gauges to signage and paperwork had to be created and accurately reflect a period Japanese nuclear facility. This piece of concept art set the look of the facility. RIGHT Concept art details the irradiated ruins of the town outside the Janjira facility. "I love the postapocalyptic imagery," says Edwards. "And I just love the Japanese imagery. It's something foreign and alien anyway, even when it's normal looking. Janjira is a made-up city, but obviously Tokyo was the main influence for how this could look." ABOVE Years after mysterious Janjira meltdown, the Brodys venture into the quarantined area, now known as the Q-Zone. OPPOSITE LEFT AND ABOVE Concept art depicting the Q-Zone. "The great thing about haze and fog is that you can create beautiful, dark foreground silhouettes," says Edwards. "It really gives a sense of scale and scope." OPPOSITE BOTTOM RIGHT Q-Zone set dressing showing a weathered radiation warning sign. RIGHT Concept art imagines the surreal effect of the giant monsters, such as this nuclear submarine dropped in the mountains. "I love this shot," says Edwards. We struggled with trying to find a position for the submarine that didn't feel too silly, but you could still read it from a distance. This is a shot that's never in the film, they don't actually approach it from the boat, but again, things get drawn just to give it flavor." OPPOSITE A stunning piece of concept art [top] showing the submarine's propeller suspended from the forest canopy, formed the basis for the final film frame [bottom]. ABOVE The "monster hunters" on the track of the MUTO in the jungle sequence. BELOW Storyboards map out the suspenseful submarine sequence. And here is the book cover!